geoAMPS is a new, proud sponsor of the Humane Society of Delaware County. The technology company is located in the Delaware County community of Powell, Ohio. The Humane Society of Delaware County (HSDC) is a non-profit organization dedicated to helping abused, neglected and homeless pets find permanent homes. HSDC serves and protects animals by conducting cruelty investigations, providing humane education, operating a low-cost vaccination and wellness clinic, and reducing pet overpopulation through a low-cost spay and neuter clinic. geoAMPS employees donate to a company charity fund throughout the year. The employees vote on which charity will be the recipient of the dollars collected throughout the year. 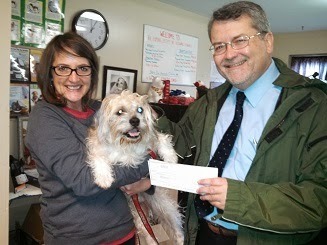 Recognizing the vital role that the humane society plays in the Delaware County community, geoAMPS’ employees decided to donate all of the funds collected during 2013 to HSDC. Through the employees’ donation, geoAMPS became a Gold Sponsor of HSDC. “All of us at geoAMPS are pleased to sponsor our local humane society and help that organization fulfill its important mission,” Yogesh said. Dan Liggett is Communications and Public Relations Manager of geoAMPS, a technology company located in the Columbus, OH, area that specializes in software solutions to manage land rights and infrastructure assets. For more information, call 614-389-4871 or visit www.geoamps.com.